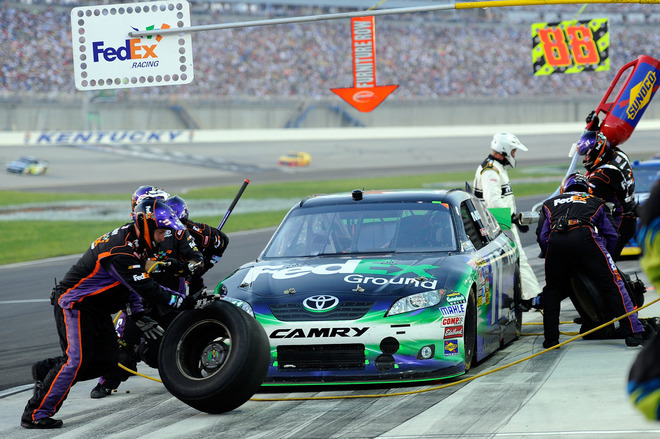 Denny Hamlin had a very rough weekend at the inagural cup race at Kentucky Speedway. The weekend started out bad with motor problems in practice. None the less, the 11 FedEx team fought back to a solid 10th place finish securing them in 10th, the final spot in the chase before the wild card. The weekend went sour quick after the #11 FedEx Camry had engine problems during practice. The team diagnosed it to be a bent crankshaft. Denny’s team would have to change the motor, and would go on to get only 2 laps of practice before the race. Due to the engine change, Denny had to start in the back of the field. Denny started 40th and drove up to the top 15 in a dominating fashion. Unfortunately that’s where Denny stuck as the night fell. As it continued to get darker, Denny continued to get tighter and the car started slowing down. Even at that, Denny still had a dominating car showing some of the best lap times of the race that were comparable to the leader Kyle Busch. Unfortunately track position would continue to fight Denny the rest of the night. 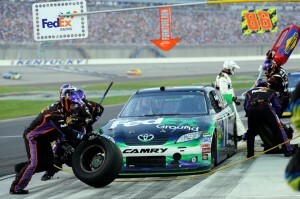 On every green flag stop, Denny was plaqued with a yellow that nearly or did put him a lap down. Luckily Denny had the lucky dog to keep him on the lead lap. On the final restart, Denny restarted 13th. During final two laps Denny fought hard in a sea of hungry cars and just barely passed Jeff Gordon for 10th place. Denny and the FedEx team fought hard after lots of bad luck throughout the weekend, but once again proved they are a championship contending team by solidifying their position in the chase at 10th in the point standings.